Big Bill Russell passed away not long ago. 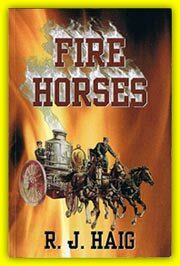 He was a special member of the 7th Battalion. If you had to create a person who looked like a swash buckling pirate , Big Bill would be the perfect model. He was a large man with broad shoulders and a bit of a beer belly. His hair was jet black. His face was ruddy like it had been wind burned from sailing the Spanish main. He had a hearty laugh and a mind as sharp as a stiletto. Not many who ran with him knew he was a member of Mensa. This is an organization of geniuses and near geniuses who meet yearly to exchange far out ideas and scholarly thoughts. You could always find Bill at the end of the pipe when battling a fire. He was dependable and good at his profession. Big Bill had many interesting stories to tell. He ran a store front church on his days off and he enjoyed having a beer with friends. He didn’t mind a good fist fight every now and then. He once told me he enjoyed a yearly trip to Montreal Canada to visit his French Canadian in-laws. It was fun for Bill because it usually ended up in a brawl. Bill really helped me out when we were preparing for the annual tough man competition. 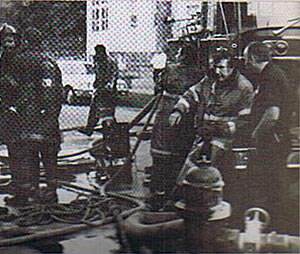 This was a self imposed ritual to prove the toughest men in the fire department ran in 7th Battalion. The man I picked was Greg Best. 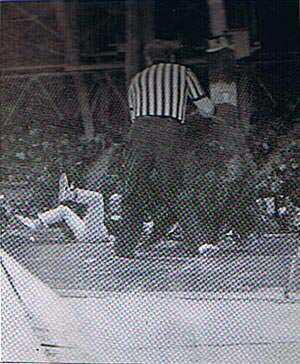 I was able to work a deal with the Sportsmen’s Show, at the Fair Grounds, to have Greg wrestle a bear. Greg was young and strong but we had no idea how to prepare to fight a bear. Big Bill was listening to us talk about the upcoming contest and said, “I know how to do it. I’ve fought four bears in my time.” I knew Bill was involved in many things in his life but bear fighting seemed like an odd thing for such a smart man to do. "All bears are like humans. They are either right handed or left handed. Find out what he is and circle away from his power. Lean into the bear. Do not let him grab you behind your legs. Have a hand full of Vaseline in your hand, when you enter the ring, and try to smear it on the bear's paws. It will upset his footing. If you can stuff a couple of fish in your waist band you can use them to divert the bear if he knocks you down. Above all things.....do not piss the bear off,." Big Bill advised. Confidant in the advice Big Bill had given him Greg showed up at the Fairgrounds. With him was a big contingent of supporters from the Seventh Battalion. The previous year Danny Chemotti won the tough man contest by knocking out Augie Doggie Saylor in Lansing in a boxing match. Greg was determined to carry on the tradition of the 7th Battalion by winning his contest with the bear. Bill and I were acting as Greg's seconds. We were in our corner of the ring waiting for the bear. The lights dimmed and Rocky music started to boom from the loud speakers. The spot light flashed to the entrance from the locker room and out came a 1200 hundred pound Kodiak bear. Me and Bill started to leave. Greg said, "Wait a minute. I thought you guys knew how to fight a bear." "Bill said, "All the bears I fought were small black bears. You're on your own with this one laddie." Before we could change our minds the contest was on. The bear was muzzled and declawed. His trainer yelled those foreboding words again, “Don’t piss off the bear.” The bear’s eyes were wild and red like he was recovering from a hangover. I could smell his foul breath all the way across the ring. The bell rung. Bill and I jumped out of the ring. I can tell you that Greg Best is one tough character. He charged the bear driving his head into the huge animal’s midsection. As he bounced back he smeared Vaseline on the bear’s gigantic paws. Greg quickly determined the bear was right handed and circled to the left. The bear dropped to all fours and slipped and fell because of his greased paws. This enraged the bear. With a roar that startled everyone he charged across the canvass. Greg was still circling to the left but he was running with his back to the bear. It was twice around the ring before the bear caught him. Greg turned to make a last stand and the bear crushed him close in a bear hug. Their faces were so close I thought the bear was trying to kiss him. Greg later told me the bear’s breath was so foul he almost fainted. Greg whispered something in the bear’s ear. This really pissed the bear off. He tossed Greg in the air and batted him with his huge paw. Greg flew across the ring like a ping pong ball.. The contest was over. The bear was disqualified for not listening to the bell that ended the round. We walked away victorious and once again proved the 7th Battalion was a place where tough guys ran. On the way home I asked Greg what he had whispered in the bear’s ear to make him so angry. He said to told the bear he looked like one of the Mayor’s administrative assistants. I laughed and thought: He must have been a Union bear. Big Bill after helping rescue a trapped Firefighter. Greg Best tackles the bear. 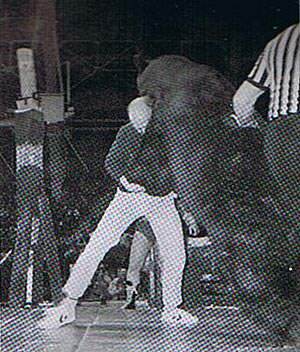 The bear knocks Greg out of the ring.